BANGI, 23rd Oct 2012 – Self motivation and the determination to excell in anything she does, was the key factor that led to Charlene Chen Chwee Yinn being selected to receive the Tun Abdul Razak Award at the 40th convocation of The National University of Malaysia (UKM). Charlene who graduated with a BA Hons in Accounting with excellence received a gold medal and cash prize of RM5000. Currently in her third month working at Price Waterhouse Coopers (PwC), she plans to work and gain experience for five years and at the same time take Association of Chartered Certified Accountants (ACCA) Profesional Paper. “Basically my plan was to work as an auditor for a minimum of five years, while taking the ACCA Professional Paper and then after I have enough experience I might shift somewhere else or probably further my studies for a Masters degree,” Charlene said. Recounting her four years in UKM, Charlene admits there were both good and bad memories, the most enjoyable being her participation in the Mobility Outbound programme in South Korea where she studied for one semester (4 months). “It was a dream come true for me as I had always wanted to go to Korea, but it was actually a big and difficult decision for me to make, because they told me if I went I would have to extend my studies in UKM. 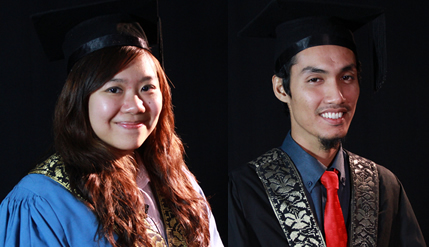 But I made the decision to go and when I got back to UKM I managed to finish my degree in the allocated time”. Admitting it was a rush to finish her thesis in time after returning from South Korea, Charlene says she has no regrets going to study in South Korea. “Knowing that I would be the first in my family to graduate from university, made me more determined and motivated to be successful. I’m not just doing this for myself but hopefully bring about a better life for my parents and my siblings,” said the eldest of four. Where Charlene was self-motivated and hardworking, it was quite the opposite for the Vice Chancellor’s Award recipient, Muhammad Nazmi bin Abdul Halim, from the Faculty of Islamic Studies. He received a cash award of RM2,500 and books from Penerbit UKM. Nazmi remembers his time at UKM of being shunted between two residential colleges Kolej Rahim Kajai in his first year, then moving to Kolej Aminudin Baki in his second year before moving back to Rahim Kajai in his third year. The moving around the colleges was due to his participation in football. During his stay in Rahim Kajai he was part of the gold medal winning team for Sukan UKM (SUKEM). “My move to Aminudin Baki was to be a part of the football team representing UKM in the Malaysian Universities Sports Council (MASUM) competition”. Nazmi said his first choice was to enrol in University Malaya (UM) to study Syariah but chose UKM instead so that he could take up Islamic Theology and Philosophy. He received news of his selection for the award from a friend, who posted it on his Facebook wall. “I couldn’t scream in happiness because I was in an internet cyber café, so I just smiled. People were giving me weird looks because I was grinning and smiling like a madman,” Nazmi said. Though he received many congratulatory messages there were some who were sarcastic and cynical in their reactions upon hearing that he had won the award. “I guess they believed that I didn’t deserve it as they always see me playing football and being relaxed and having fun. They don’t see me study and that could probably be the reason,” Nazmi said. He never believed that being a bookworm was the only way to be a good student or to be successful. He made it a habit to take time and have fun, be a part of the campus community and not hibernating in his dormitory room during his three years of studying. Proving that he was not just a sportsman, Nazmi had also been in the Dean’s list for five times for academic excellence during his three years in UKM. Nazmi who received his BA Hons in Islamic Studies with Excellence wants to become part of UKM fratenity and hopes to join the Faculty as a lecturer to give back the knowledge he has acquired and at the same time to continue to grow and continue with his studies.